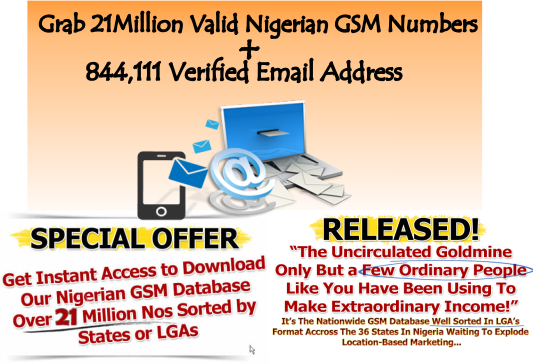 Get active GSM phone numbers database classified by (Name, Gender, Location, LGA, State) for the whole country. mobile marketing,product launch or election campaigns couldn’t be this easier! It is 100% return guaranteed! Nationwide: 250, 000.00 ( Two fifty thousand naira only). Engage with your audience today by giving them the best mobile treat possible. Order now! Do you want to DRIVE MASSIVE SALES, PATRONAGE or AWARENESS to your Products/Services or for political campaign ? EVERYBODY READS THE TEXT MESSAGES ON THEIR PHONE! Why use BULKSMS/GSM DATABASE ? Why not use radio, TV or newspaper for your advertisement ? More than 65% of Nigerians use GSM phone daily. The best part is that 99% of mobile phone users open there text messages and our gsm database is a must have. we accept only genuine and honest use of the database. Techchoice Limited , its agents and staff are working day & night to ensure we track down any one found using any of the number in our database for any issue from dishonest and fraudulent use of the phone numbers. Therefore, if you have any illegal plain to use our Database phone numbers for, please dont even bother to call/sms us. kindly keep your money. We also have Active Nigerian Business & Co-operate GSM Database Phone Numbers + E-mail Database based on Occupation (Student, Workers, Business people, Co-operate, Professions, Bankers, Job Seekers, lawyers) etc…. 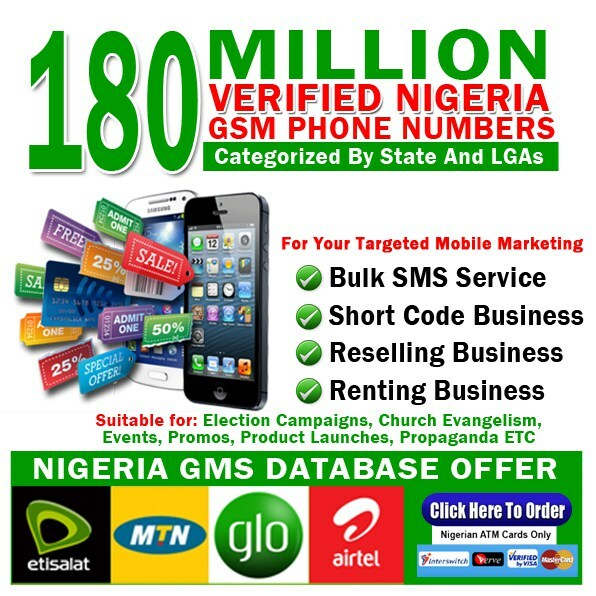 We have Verified Gsm database categorized according to Location, Profession, Business, Co-operate etc that will give you the desired returns on your marketing campaigns. We also have their valid emails for your Email Marketing Campaigns. Office C123, Road 1, Ikota Shopping Complex, VGC. Suite 207 Ahahuru Plaza, 44 Ebony Clinic Road, By Big Tree Junction, Oroazi.